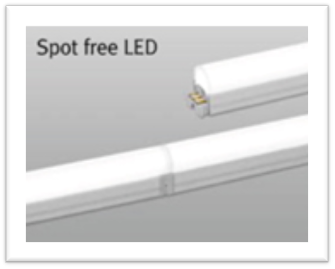 Feelux’s Diva2™ High Output (HO) is a high power, low profile linear LED luminaire designed to provide a High Output LED alternative to fluorescent in under cabinet millwork and display for retail, residential or architectural applications. Diva2™ HO is an extension of the popular Diva2™ Series and is available in nominal 6” and 1’ to 4’ standard lengths with five Kelvin temperatures ranging from 2700 to 6500K. This eco-friendly luminaire features 75lm/W and a lamp life of over 40,000 hours. With a small profile of only 0.35” H x 0.42”, the Diva2™ HO provides a variety of mounting options and full range dimming. The Diva2™ HO can be recessed or surface mount on wood, glass or metal and comes with mounting brackets and internal magnetic strips that adhere to metal or glass. This innovative luminaire features an optional round or square diffuser that delivers the appearance of a “Spot Free LED” luminaire. It is designed with integral quick connections systems that deliver seamless, dark spot free illumination and enable quick installation by simply snapping fixtures together to create the length desired. The Diva2™ HO comes with a variety of accessories such as an inline controller, a cabinet door sensing on/off switch, and flexible connectors. The visible light source delivers soft even illumination effects with standard 3W, 6W, 12W, 18W or 24W Ra>80 LEDs. The Diva2™ HO delivers a slender fixture that fits almost anywhere and yet delivers an eco-friendly and powerful LED illumination solution.